Commercial flooring used in high traffic areas has to be durable, reliable, and easy to maintain. At the same time, it has to have an aesthetic appeal which will positively represent the owner of that property. With bamboo, you have a material that is harder, and more moisture resistant than many hardwood flooring choices. However, it is still relatively soft compared to other materials, and will not be appropriate for all commercial applications. Scratches: If you have a lot of people walking across the floor each day then you are going to have a problem with them unwittingly dragging small particle debris across the surface finish causing scratches and damage which will accumulate over time. You also have no control over the state of high heels that someone might be wearing on that floor's surface. Water Damage: If the floor is near an exterior entrance then you want to use mats to try and cut down on moisture and small particle debris that is tracked in. 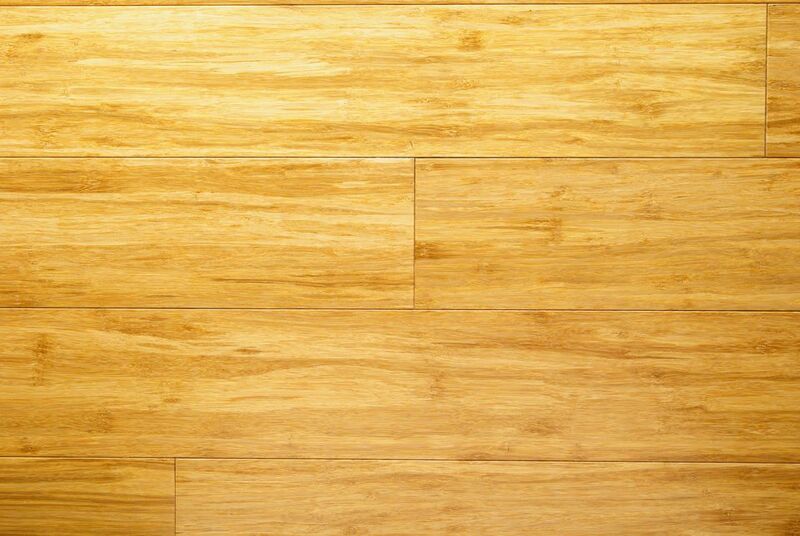 Bamboo should also be avoided in most wet environments such as bathrooms and kitchens. Maintenance: With urethane finished and engineered bamboo floors you have to maintain a routine of periodic sweeping and or vacuuming. This is in addition to occasional stripping and refinishing. With waxed finish bamboo floors, you will need to use professional buffing equipment from time to time. Comfort: If the floor is being installed in a location where people will be forced to stand for long hours during the day, then the comfort of the material is important. Bamboo is moderately hard and is comparable in feel to the hardwood. It will be more yielding and comfortable than hard tile, but won't have the give of cork, vinyl, or other padded options. Life Cycle: Most commercial warranties on bamboo floors will last for 5-10 years depending on the manufacturer and the retailer. It is important that all instructions and stipulations are minded during the installation so that the warranty is not voided. With Engineered bamboo, the finish is the wear layer that rests over the surface of the bamboo embedded in the material. With strand woven and solid bamboo, the following commercial finishes are available. Aluminum Oxide Urethane Finish: This is the most common finishing agent used on bamboo floors. It creates a light, powerful, and invisible protective layer over the surface of the floor, which will keep it relatively safe from stains and water damage. It will also provide some protection against scratches, although it is not a barrier, and small imperfections will still appear over time. Commercial Bamboo Waxing: Wax is not recommended for most residential and small business flooring installations. That is because it will require periodic buffing using expensive, high-powered machinery that most people do not have access too. Once the wax has been applied to the floor once it can never be stripped or removed, and the floor cannot be refinished. However, if you are a company or an individual with the resources to have the floor buffed on a regular basis by a professional, then a wax finish can be one of the best ways to protect your bamboo floor investment. It will act like a thick, invisible barrier, that will stretch across the surface of the material, preserving and protecting it from nearly any damage. Waxing is the only commercially viable way of having a bamboo floor in a high or very high traffic location. Engineered: Easy, low maintenance choice for medium traffic locations. This flooring is created when a thin strip of bamboo is sandwiched between a fiberboard and water insulated back side, and a protective wear layer on its surface. The hardest and most durable option, it looks just like natural bamboo, but will not be as susceptible to scratches, dents, water damage, and staining agents. It will also require less maintenance which can save you money in upkeep costs. The drawback to engineered bamboo is that it is a one time deal. Unlike more natural options, it cannot be sanded down and refinished at a later date to give it a new look. There is only one wear layer on engineered bamboo, and while it is durable, it will wear down over time, especially if the location gets heavy foot traffic. Once the wear layer starts to fade the material will quickly begin looking worn and tattered. This is balanced out to some extent by the ease with which engineered materials can be installed, replaced, and removed. With click together pieces you can generally get a layman to do the installation, and if a tile or plank is damaged it can simply be pulled out and replaced. This also makes removal at the end of the floors life cycle much easier and more cost effective. Applications: Best in medium and low traffic applications where you need a material that looks natural but doesn't have the maintenance headaches and costs associated with solid or strand woven materials. The thickness of the wear layer will determine how much traffic the floor will be able to handle, and how long it will last. Strand Woven: A solid moderate strength bamboo with a real, natural feel. This is a relatively hard flooring material which is created from bamboo pulp mixed with an adhesive and then forced into shape via pressure and heat. Stronger and more resilient than solid bamboo, strand woven materials will still be susceptible to some damage from scratches, and staining agents. The advantage of strand woven bamboo in a commercial location is that it can be refinished, every few years, giving the floor a completely fresh new look. Depending on how thick the material is you may be able to refinish it several times before you will be forced to replace it. Note: Refinishing is only possible for urethane-based finishes. Wax finished bamboo floors cannot be stripped or sanded. Applications: This is going to be best in areas that get moderate or low traffic. The feel of the material will be more authentic than engineered choices, and you will be able to refinish it periodically so it can be a fairly stylish choice. However, strand woven floors tend to have fewer distinct features and markings on their surface than other choices. An attractive and stylish choice for low traffic applications, this is going to be the prettiest and most natural looking option available to you. Manufactured when thin strips of stalk material are heated and pressure bonded, solid Bamboo retains many of the unique characteristics and features which are found in the actual plant. This leads to floors which have personality, and unique characteristics running through every inch of the surface. The price you pay for these attractive features is that the material itself is relatively soft. It is still more resilient than most hardwood flooring options, however, it is the softest bamboo choice that you can make. For this reason, it should only be used in lightly trafficked areas, where you want to impress visitors with your sense of style. It is a particularly good option for professional offices and executive boardrooms.